The alien four armed creature continues to attack the city, now accompanied by an even stranger four legged beast Mikey dubs “dino-dog.” Leo, Don, Mike and Splinter attempt to stop the destruction while April and a slimey reporter named McIntyre broadcast the story. Leonardo cuts off one of the armored figure’s arms, sending it into a painful retreat. The dino-dog leaps at the camera crews filimg the action and embeds itself into a news van, where it lays unconscious. The armored warrior then grabs one of the video cameras from a newsman and takes it to an abandoned alley. The Turtles discover that their adversary is blind, but in short order it attaches the camera to its head and uses it to see. Leonardo approaches the being, holding the severed arm. The Mutant Turtle apologizes for the attack and tries to give the limb back, but it suddenly springs to life and chokes him! The other Turtles implore the alien to release their brother. The creature slowly begins to assimilate the English language. After releasing Leo from its grasp, the alien explains that it is a Triast, one of a race of sentient, silicon-based lifeforms created by the Mergia. The Mergia had created the Triasts to work for them, but after time, the Triasts desired freedom, and a war broke out. The battles lasted for years, until the Triasts themselves created the “dino-dogs” called “Battle-Beasts”, which gave them the upper hand in the conflict and sealed their victory. The Triasts tried to lobby for equal rights with the Mergia, but the creator race wouldn’t accept the terms (even in defeat), so they fled the planet. This Triast’s master left it with a final insult, taking its eyes before he left, leaving it blind. The Triast explains that the Battle-Beast accompanying it, named Qark, is helping it track its master. The alien pair have followed their prey to Earth. As the Fates would have it, the alien in issue #3 was the Triast’s master. The former slave was able to retrieve one of its eyes from the wreckage of the space craft. It then explains that it needs all three of its eyes before it will be able to see properly. Mikey asks the alien of its name is Sarnath, and sure enough, it is. The Turtles take Sarnath back to their lair, where they receive a call from April, who informs the terrapins that McIntyre’s TV show “Inside Affairs” is about to broadcast live footage of the captured Qark. Sarnath states that he can see what Qark sees, and the “dog” is surrounded by cameras. Donatello reattaches the symbiot’s arm and then hooks up a monitor to the video camera that the alien is using to see, giving everyone a clear view of Qark’s predicament. Donatello breaks into the control room of the TV studio and destroys the circuit box, sending the theater into darkness. The Turtles free Qark, just as the lights return – leaving our heroes in the spotlight. Leo shouts “Vanish!” and our heroes make their escape, leaving the studio full of bewildered reporters. April mocks McIntyre for losing his big story, and the man suspects that she’s involved with the mysterious “green men” due to her smug attitude. Outside, Donatello explains to the disheartened Sarnath that his other two eyes were transported 100 years into the future. The other Turtles lament that the whole world has seen them, thanks to McIntyre’s live broadcast. Splinter states that they’ll have to maintain a low profile for quite some time and then Sarnath invites them to accompany him to Dimension X. Mikey is excited about the idea and Leo muses that they could try to fnd out what happened to Cudley the Cowlick. Splinter consents, and Mike, Don and Leo head off to the other dimension with Sarnath. Meanwhile, Raph and Ninjara are having a picnic in Japan when Sarnath’s ship arrives. 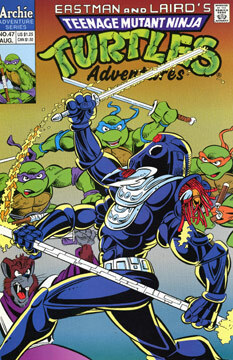 Ninjara and Raph join the others, and as they head into space, Leonardo tells the pair about their unexpected TV appearance. Back in the TV studio, McIntyre studies the footage of the TMNT.